Roughly chop up the white chocolate into small bits. Crush the Oreos using your hands, or you can put the Oreos into a Ziploc bag and crush . 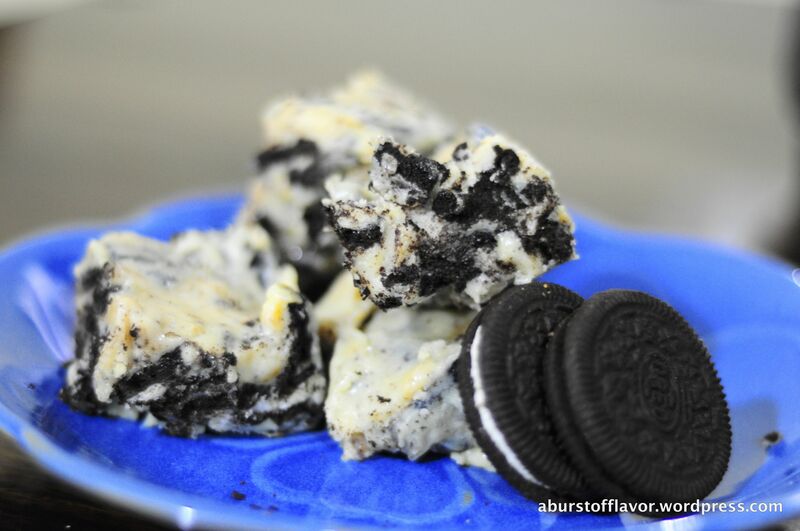 Make sure the mixture is chunky and not a fine powder; the Oreo chunks add a beautiful texture and taste to the fudge. Transfer the white chocolate to a wide bottomed pan on medium-low flame. Stir nicely until the chocolate is melted and incorporated into the condensed milk. Add vanilla extract. Stir nicely to mix. 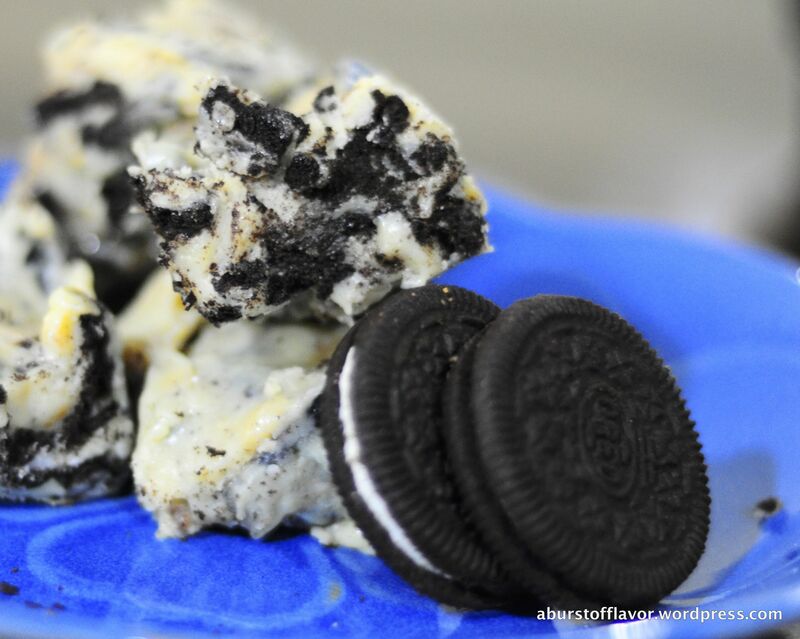 Add the crushed Oreos and mix. Immediately transfer this to a tray and let it cool for 10 mins. Put the tray in the refrigerator and let it set for 2 hours. Once set, remove from fridge and cut into bite-sized squares. There is enough sugar in the chocolate and condensed milk as it is. No extra sugar is required. The condensed milk might overpower the flavour of white chocolate, so it is better to add it sparingly. 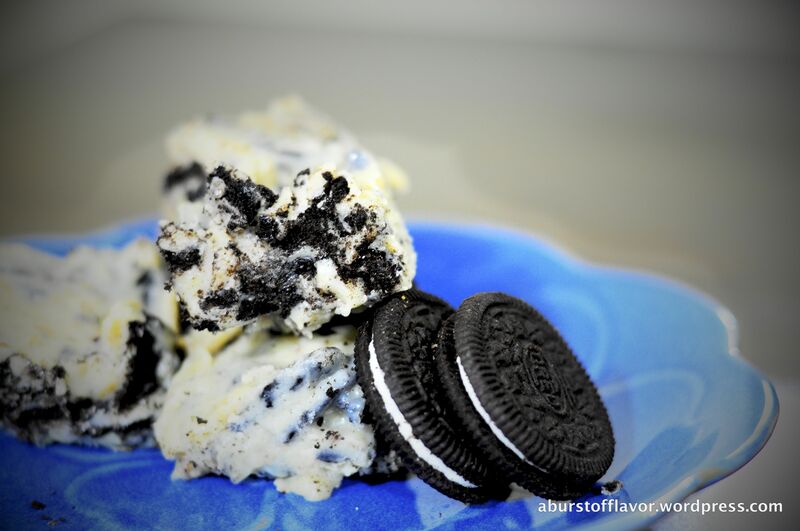 The Oreos can be used with their cream filling – using chocolate Oreos (like Averie has) would add milk chocolate to the equation and cut the sweetness of condensed milk. Always store in refrigerator in an airtight container. This bar will keep for upto two weeks, maybe more. Thanks for trying my recipe! Your fudge turned out wonderfully! OMG..this is so wonderful!! I might try this out to make peace with a little chocolate/sgar monster that we have at home. I must also say, I am quite enjoying the other recipes too! The pasta primavera was my start button, but all this..too good! 🙂 Hoping to replicate at least a acouple of other recipes!